Delta Ponds is a 150-acre waterway site consisting of numerous ponds, channels, wetlands, and associated riparian areas. This unique natural area owned by the City of Eugene borders a stretch of the Willamette River, just downstream from Valley River Center. 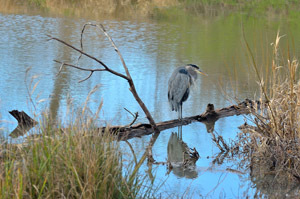 For many, it is a favorite spot for bird watching, fishing, and enjoying the outdoors. Up until the late 1800s, the Delta Ponds area was part of a river floodplain network of side channels, sloughs, and tributaries that provided a rich habitat well-suited for many native fish and wildlife species. Over time, flood control management, urbanization, and land use practices changed the area dramatically. The ponds, peninsulas, and islands that are present today at Delta Ponds were formed by gravel extraction operations that took place in the 1950s and '60s. These activities provided much of the gravel for the construction of Interstate 105 and other local roadways. Perhaps the biggest change to the area was that following gravel mining, this former side-channel of the Willamette River became disconnected from the river. The City purchased the ponds from Eugene Sand and Gravel in the late 1970s. Up until 2004, the site was largely unmanaged and the natural succession that took place created both valuable habitat for a variety of wildlife and resulted in colonization by a number of invasive species, such as Armenian blackberry, Scotch broom, and English ivy. 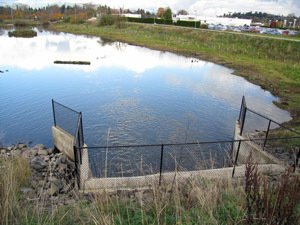 Between in 2004 and 2012, the City of Eugene led a large-scale effort to restore the Delta Ponds as a side channel of the Willamette River. The goals that this project set out to achieve were to: (1) re-establish hydrological connections between the mainstem Willamette River and the Delta Ponds to restore 2.2 miles of side-channel habitat to the Willamette River; (2) improve in-stream and riparian habitat for a wide variety of species including juvenile Chinook salmon, American beaver, western pond turtle, river otter, and neo-tropical migratory birds; (3) improve water quality; and (4) provide recreational and educational opportunities to the public that would lead to increased stewardship of this valuable natural area. In 2012, the Oregon Department of State Lands honored the City with the Stream Project Award for promoting responsible, sustainable stewardship of Oregon's natural resources through this project. Fish and wildlife monitoring efforts have shown the presence of juvenile Chinook salmon in the ponds during winter months, have documented use of the area by 155 species of birds, and have identified a population of nearly 60 Western pond turtles. Learn more about the Delta Ponds Ludwigia control efforts and how you can help here. 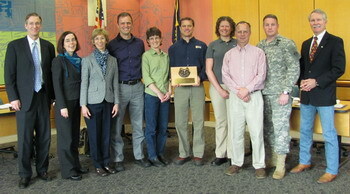 In early April 2012, the City of Eugene’s Delta Ponds Enhancement Project was honored to receive a State Land Board “Stream Project Award”, which recognizes responsible, sustainable stewardship of Oregon’s natural resources, as well as partnerships that advance the work of the Board. The award was presented by Governor John Kitzhaber, Secretary of State Kate Brown, and State Treasurer Ted Wheeler at a ceremony in Salem. City partners on the project from the U.S. Army Corps of Engineers and the NOAA Restoration Center joined City staff at the ceremony. Help activate the power of parks by getting involved with our Eugene Outdoors volunteer program. Learn new skills, meet great people, and improve the quality of life in Eugene by helping to care for our parks and open spaces.